The Playa del Carmen Language Institute is located in the beautiful city of Playa del Carmen in Mexico. The region boasts some of the most beautiful sandy beaches throughout the world and the language school is situated a short 5 minute stroll away from some of them. Below you can find out more about this school, observe course details and read the student reviews. School info: Mid-sized school with spacious classrooms, free internet access, study centre for students, common area, free tea and coffee, located in Playa del Carmen. 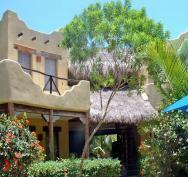 Situation: The school is located in the coastal town of Playa del Carmen near the beach and tourist attractions. The language school is housed in a typically Mexican building and offers 6 levels of Spanish, free internet access, free tea and coffee and a study centre for the students to use. The 6 levels of Spanish are 2 levels for beginners, 2 levels for intermediate and then 2 levels for advanced students. When each level has been completed the students are awarded with a certificate, one single lesson lasts for a hour's duration. The maximum number of students per class is 8 and if there are less than 3 students attending an afternoon class then the students will receive one to one classes instead. All learning materials are included in the price but students have to provide their own pencils, notebooks and dictionaries. There is a garden area and also a swimming pool available for students and the school hosts a welcoming party for the students on their initial Monday. There are activities held including cookery, diving, dancing and excursions some of these do incur a small charge. Geography: Playa del Carmen is situated in the Mexican state of Quintana Roo. Description: The city of Playa del Carmen is a destination that seems to offer a wide array of choices for its visitors. On one hand there is the beautiful beach and on the other the wonderful parks to visit; shopping is also on offer in the city as is fine dining in the numerous restaurants.